Are you looking for a pushchair which has it all? Thanks to its sturdy frame - only 55 cm in width - and all-terrain shock-absorbing wheels, crowded streets in the city centre or a uneven tracks in the countryside are no challenge for the Maxi-Cosi Stella. Ok pushchair - good quality fabrics and wheels but wheel keeps locking itself - seems like a recurring issue with this pushchair. I got this pushchair when my daughter was about 8 months old. I felt like a kid at Christmas opening it. It was really easy to assemble, fantastic quality and very sturdy. There are so many pros to this pushchair. For starters the 3 different reclines has been invaluable to us. My daughter has a floppy larynx so have a recline where she was far back enough to sleep but not put pressure on her breathing was fantastic. The extra large hood is amazing. I've used it when it's very sunny and it's great for when they fall asleep and you are out and about. You can shade them from random strangers trying to look at them and they are protected from the words. My daughter loved the t bar, pretending to drive with it and playing the drums. It's very easy to fold and fitted easily in my tiny car. The handle bar height was amazing. I'm quite tall but I didn't need to adjust it. If you are very tall the extension would be suitable for you. The shopping basket is small so you can't fit a lot under there but we used a buggy clip. You can easily hang a changing bag over the handle bars and it won't tip the pushchair. The movement of the pushchair is amazing you can zoom in and out of the smallest gaps and the turning circle is excellent. Only con i can think is that the pushchair is a little heavy, however the ease in which it moves far outweighs this. Also it adds to the sturdiness. I've felt much heavier pushchairs. The design is lovely, everything is very good quality and I highly reccomend. I've had 4 pushchairs in total and this is my favourite. I love this pram. Got it for my daughter and found it so easy and smooth to push. I got the black and found it an all around nice simple and stylish colour. It was really simple and straight forward to put together and the lifetime warranty is amazing(although I've never had a problem I think it's a great thing to include). The actual design of the pushchair is fab, parent and world facing, folds in one easily, the super large hood is my favourite feature about the pram as I can get it to cover all the way to my daughters legs and block out all the sun, wind, rain. The crotch bar was really handy feature for when my daughter doesn't particularly want to go in the pram and holds her there nicely while a strap her in. I found the pram works well on lots of terrains, I've taken it to the park, walks on gravel, bumpy paths, mud and it's rolled through with ease. It's a nice sturdy but beautifully designed, easy to use and nicely compact pram and I'd definitely recommend it. I purchased this pram when pregnant, this is my third child and I was determined to get the pram correct after swapping numerous times with my first children. I am so glad I chose this. I love the large sturdy wheels that are great for off roading or the beach. 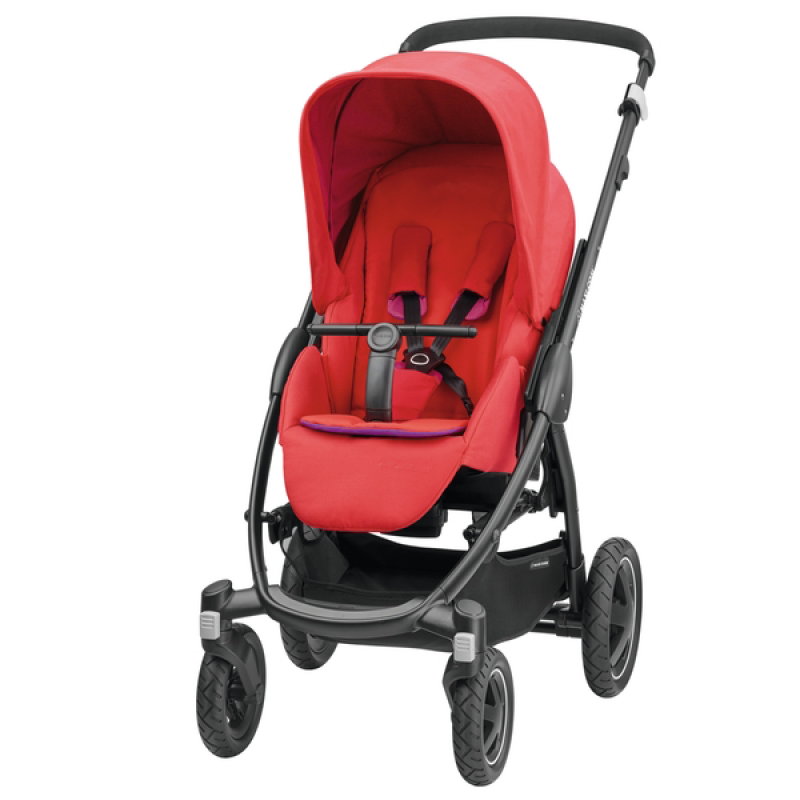 The parent or world facing mode of the pram body, the extendable hood to keep off the sun and the height adjustable handle. The slim design makes it easy to manoeuvre and the two different fold modes means I can stand it upright in my hall. The only improvements I would make are to enable the mattress in the carrycot to sit up slightly, I found that my little one was out of it at 3 months because he wanted a bit more visibility and got frustrated in it. The basket isn't great for access if your using the pram body rather than the carrycot, other than that I love it and get lots of comments about it as it isn't yet a common pram.